As the name implies, InSafe winders were primarily designed for the watch collector who keeps his/her watches stored in a safe or vault. These units are totally "wireless", operating with four ( 4 ) standard "D" cell alkaline batteries. With battery life measured in years, not months, there is no need for providing AC power in the safe. However, an AC/DC adapter is also supplied. The InSafe case is constructed from light weight wood panels with rugged mitered and glued construction in order to prevent handling damage. The case is totally covered with an attractive and durable black textured vinyl with simulated wood-grain finish. 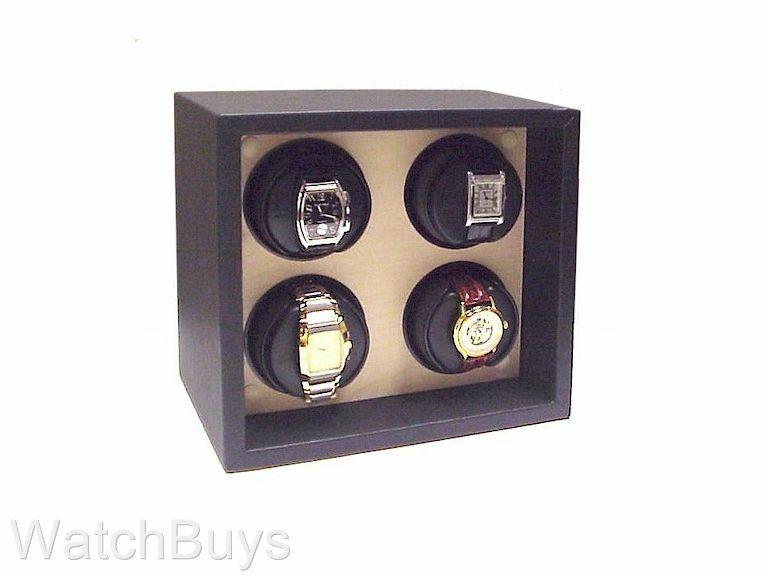 The rotating watch holders are fully recessed in the case so that stacking multiple units together front-to-back never exposes your watches to damage. Unlike other winders, which rotate a watch in order to wind it, these units gently swing the watch instead (a patented design - U.S. Patent # 6,543,929). Every 10 minutes (standard program) or every 15 minutes (extended program) the internal control microprocessor signals the drive motor to make a single turn. Then, gravity action causes the watch to swing back and forth for several oscillations just as it would while worn on the wrist. The 15 minute program allows many watches that wind in both directions to remain fully wound while on the winder with increased battery life (as much as 50%). The oscillating winding action of the watchwinder is totally self-regulating and there is absolutely no chance of damaging an expensive watch by over-winding. Made from a dense, non-magnetic iron material, the winding system is supported by two free-turning precision ball bearings, thus enabling the heavy mass of the rotor to produce the "back and forth" motion when the cup is raised and then released from the 12 o'clock position. Please note that the pricing shown for the InSafe winder is the open front unit only. Orbita also produces an InSafe model with a side door, and an InSafe model with a drop door. The pricing on these two units is $1,860 - please contact WatchBuys if you wish to order one of these units.